PocketOptimizer is a computational method to design protein binding pockets that has been recently developed. Starting from a protein structure an existing small molecule binding pocket is optimized for the recognition of a new ligand. 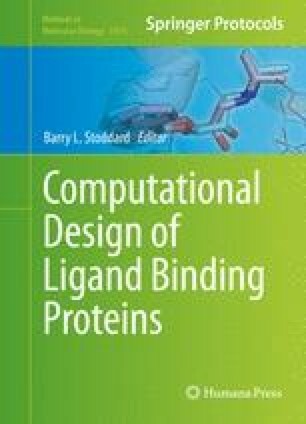 The modular program predicts mutations that will improve the affinity of a target small molecule to the protein of interest using a receptor–ligand scoring function to estimate the binding free energy. PocketOptimizer has been tested in a comprehensive benchmark and predicted mutations have also been used in experimental tests. In this chapter, we will provide general recommendations for usage as well as an in-depth description of all individual PocketOptimizer modules. Financial support from the German Research Foundation (DFG grant HO 4022/2-3) is acknowledged. M.N. was supported by the Erasmus+ mobility program. The authors like to thank Steffen Schmidt for comments on the manuscript.